Using users’ location data, Spotify will craft playlists to listeners with a reminder to vote on Nov. 6. Spotify rolled out custom notifications and playlists to its U.S. listeners, reminding them that midterm elections are fast approaching. 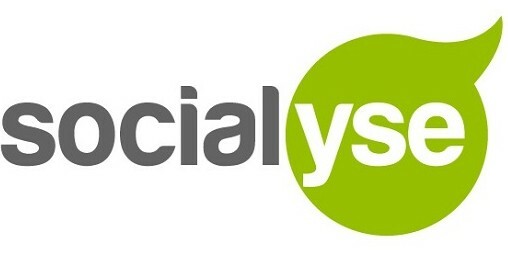 The notifications, which are personalized to users based on mobile location data and age data, began rolling out to Spotify listeners on their mobile devices on Oct. 30. A reminder to vote appears when users open the Spotify mobile app and, if clicked, bring users to state-generated playlists that feature popular songs in the state, U.S. capital or U.S. territory where the user is located. The playlists are being billed as one that users can listen to at the polls or for the week leading up. The “Get Vocal, Virginia” playlist, for example, features songs by Earth, Wind and Fire and The Chainsmokers, while “Get Vocal, U.S. Virgin Islands” has songs by Bob Marley and DJ Khaled. “Get Vocal, Alaska!,” for its part, includes various white-noise recordings. 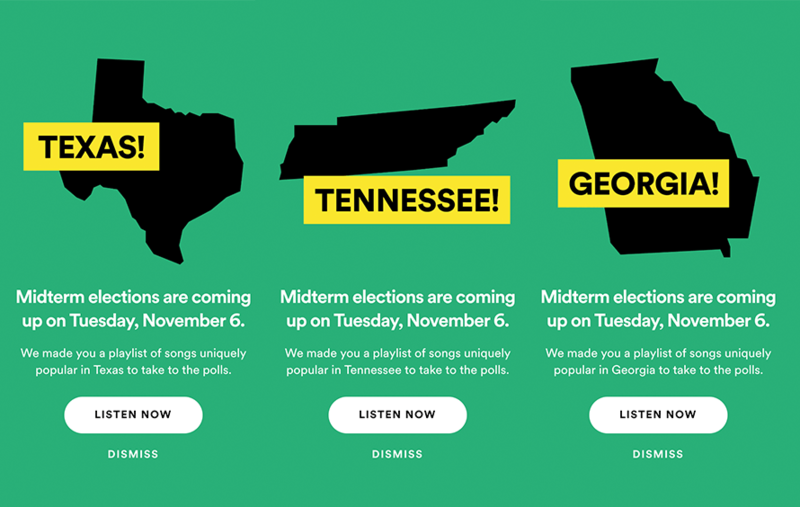 In total, Spotify created 55 custom playlists that are being pushed to users in their respective locations as a reminder of Election Day’s approach. On Nov. 6, Spotify plans to target listeners again with a reminder to vote, a Spotify spokesperson said. Both the playlist description and the Election Day reminder direct users to gettothepolls.com, which allows users to locate their polling locations if they provide their address. The initiative isn’t the first time Spotify has encouraged users to participate in the democratic process. In the lead-up to the 2016 presidential election, the music streaming service introduced a “Clarify” series of playlists made up of podcast snippets and videos with information on various political topics. A day before those elections, the company pushed an audio ad from then-president Barack Obama reminding users of Election Day and encouraging them to vote. Spotify’s just the most recent tech brand to get involved in voting initiatives leading up to this year’s midterm election. Platforms like Snapchat, Facebook and Twitter and dating apps like Tinder and Bumble have rolled out voter registration notifications and tools for users to learn more about political candidates. The ride-hailing service Lyft, which is offering its users deeply discounted rides to the polls on Nov. 6, recently installed a mural in New York made up of the 15 million ballots promoting its voting initiative. Spotify has also participated in various internal efforts to encourage its employees to register to vote, a move that’s become a trend at many civically minded tech companies and startups. And in case you missed it, here’s one more reminder: The midterms are on Nov. 6, 2018.